In a landshare-based society, people live in glebas. A gleba is made up of the landshares belonging to members of a family or other co-habiting group. It provides its owners with the material to build their home, their food, water and energy needs. It also provides them with space for recreation and enterprise. They need no mortgage. No weekly food bill. No electricity or gas bills. No water rates. In fact, they do not actually need to buy to survive. Consequently, the dispassionate forces of a capitalist free market could never hold them to ransom. Nevertheless, their standard of living could benefit significantly from certain specialized goods and services offered by others through a truly free market system. To utilise their particular specialist talents to produce specialized goods and services. These specialized goods and services could be solely for use by the landsharers who made or provided them. However, a portion could also be sold to landsharers of other farmlets in exchange for different specialized goods and services. This means that, from the point of view of the outside world, each farmlet is a specialized producer. It provides goods and services to which its landsharers' natur­al talents lend themselves. On the other hand, from the point of view of each farmlet, the outside world is a generalized producer. It makes available to each farmlet the full range of all the specialized goods and services from all the other farmlets in the world. Each thus benefits from the specialist talents of all. A landsharer may therefore increase his quality of life by exchanging a large amount of his single specialized product or service for a small amount each of a wide range of different products and services provided by others. This requires a system of trading. It could be a barter system. It could be a money-based system. It could be a charity-based system of simply giving what one produces to whoever may have a need or desire for it. It could be a composite of all three. Whichever way it is done, its function is simply to let all benefit from the special skills and abilities of each. In addition to providing the materials and resources for generating his goods and services for trade, the landshare is also the source of its owner's basic needs of food and water, energy, shelter and clothing. But the weather is not always equally kind to everyone every year. Drought and famine are facts of life. In some years, the glebas in some parts of the world will yield abundance while the glebas in other parts of the world will yield little. There is a case, therefore, for those with plenty to pass some of their plenty to those with little. In today's capitalist economy, those who have plenty sell food to those who have little. Those with little thereby become indebted to those with plenty. If they cannot pay they must work off the debt over time, paying interest on what they owe. They steadily become ever poorer. The disparity of wealth between them and their cred­itors grows relentlessly. What gain or motive is there for those with plenty to give to those with little? Both gain what both would otherwise lack. These are the foundation on which mutual understanding can take root. They are the conduits through which human thought and culture may flow. They are the force which could galvanise mankind into a true global family. The charitable motive for fulfilling a need provides a level of individual security which the commercial motive cannot. One community has had a bad harvest there­fore those who have had a good harvest supply their food. There is no cause to subject those in need to error-prone bureaucratic means testing. Their neighbours know from direct every-day observation and interaction that their need is genuine. A family's home has burned down or been destroyed by freak weather. Therefore their neighbours get together to help them rebuild. In a landshare-based society, all the necessary materials will be immediately available. That their need is genuine is all too obvious. The unfortunate home-owner does not have to worry about being able to supply acceptable documentary evidence as to what was lost when in all likelihood all the relevant bills and invoices would have gone up in flames along with the things they represented. Nor is he in any danger of becoming a victim to a 'get-out' clause by which his insurance company can cleverly escape liability. In providing insurance to the individual, the landshare-based society's only motive is to alleviate the individual's hardship: not to make a profit. The giving and receiving of help in times of emergency and trauma is one of the most powerful catalysts of social bonding. It is perhaps the ultimate crucible within which group reliance and personal trust may be forged. Alas, in our present capitalist society, such noble attributes have fallen victim to the cold numerics of commercial risk assessment and profit, and the bureaucratic impersonality of a faceless insurance claim-form. Thus, in a landshare-based economy, disparities in basic needs are rectified through a mode of exchange based on moral duty. 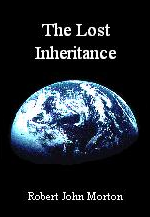 The wealth-generator - the landshare - is never traded; it is inherited. By nature, landshares are economically self-sufficient in the basic needs of life. However, the diverse talents of human kind can provide much more than the basics. They can produce specialised things. But specialised talents are distributed. For all to be able to benefit from the specialised talents of each, people need to be able to exchange what they have for what they want. In order to prosper, a landshare-based economy, like any other, therefore needs a fair and effective means of exchange - a truly free market. Since the fruits of the artisan's specialist skills are not essential to basic survival, it is reasonable for them to be traded through a free market system. To me, a truly free market is one that offers me an unbiased choice of everything that everybody has to offer. No matter who they are, how big or how small they are, how near or how far they are, or what they offer. It could therefore have little if anything in common with our modern so-called capitalist 'free' market of today. The difference is one of motive. The capitalist's motive is profit. His aim is to make his profit as large as possible. His means of generating his profit is trade. The particulars of what he sells, who makes it and its means of production are incidental. His success depends on his having sufficient capital to buy enough of the right kind of marketing experts to establish and maintain the largest possible share of the 'free' market at the expense of his competitors. The capitalist 'free' market of today is therefore closed to all but those who have sufficient capital to make their voices heard above the ever-rising mêlée of modern high-powered high-tech corporate advertising. The capitalist's health, wealth and his very survival depend totally on his ability to compete - and continue to compete - in this marketplace. The artisan's motive is different. He is driven first and foremost by his natural inherent human craving to develop, exercise and fulfil his given talents by creating something of use, of beauty, of value and perfection. The particulars of what he creates are the things that are important to him. They are his ultimate means of self-expression. They are the things by which he is known. They are the essence of what he is. The true free market is the means through which a landshare-based artisan makes his creations available to others. In it he is free to sell or not to sell. He is quite separately and independently also free to buy or not to buy. He is free to do both, one or neither. He can enjoy a satisfactory life-style without buying or selling any­thing. However, his life would be definitely enriched if he were to exchange his own special creations for those of others through the free market. The artisan, like any artist, creates because he wants to express himself in terms of a material or intellectual object, performance or service. He will do this anyway. His sole purpose is the fulfilment of his talents and the benefits his work may bring to his family and farmlet. Replicating his work for sale to others is to him incidental. Nevertheless, its effect is to stimulate social interaction which, in turn, enriches other people's lives. And it is this, not profit that should be the primary purpose of trade. The landshare-based economy, as has been so far described, has two tiers. Its first tier provides the necessities of life in a way that renders each family largely self-sufficient. Its second tier provides useful but non-essential specialities: works of artisanry and expert services effected by the landsharers within each gleba. These may be sold through the free market in exchange for different specialities produced by others. But for this truly-free market to work, It is vital that all 3 commodities, namely: land, necessities and specialities (luxuries) be kept separate. It must be recognized that they are fundamentally non-equatable and therefore non-exchangeable. It must be a 3-tier system of exchange. Land may in extreme cases be leased. Necessities can be exchanged as gifts. Luxuries (specialities) can be traded by barter or money. But land must never be exchanged with anything else, and necessities must never be exchanged for specialities. Money can therefore be the currency only of specialities. That it will inflate in value is inevitable. Inflation is an unavoidable result of human vanity. Each artisan natur­ally thinks his own product or service is better, and therefore of greater worth, than that of his neighbour. Consequently, he puts a higher monetary price on it. His neighbour follows suit. The cumulative effect is a steady but relentless leap-frogging of prices within the free market. But whatever may happen in the specialities market, the basic needs of life must never be allowed to slip out of reach of the unfortunate as a result of inflation. The needs of life must always be freely given according to need: not as a perceived reward for artisanic or entrepreneurial merit. And finally land - the essence of our planet's life-sustaining biosphere - can never be sold. It is not ours to sell. The naturally implicit terms by which every human being should inherit his landshare simply grants him its use for the duration of his life for the sole purpose of supporting himself. With it also is implicit the obligation of good stewardship, namely to preserve it in good working order for all the generations that shall come after him. The only choices he has regarding his land are either to work it or, if he is not able to work, to rent it out in return for a share of what it may yield. This three-tier economic system ensures that the needs of life are always available to everybody. And it does so by guaranteeing everyone direct access to their own fair share of the natural means of producing them. It thus insulates their funda­mental economic well-being from the chaos of the inevitable booms and recessions of the open specialities market. The centre of a landshare-based economy is the landsharer's home. This is dictated by the distributed geography, physical structure and economic mechanics of land­shares. This necessitates that the accommodation facilities on a gleba be rather different from the suburban "box" most of us live in today. I also like shapes that resemble small natural rock formations and out-croppings. The latter could perhaps be arranged to enclose a small private garden or protect­ed 'wild space'. I have always wanted to apply my analysis, design and programming skills to what are called the Alternative Technologies or Egalitarian Engineering. Consequently I have embarked on an ambitious project to develop a working model of the kind of landshare-based farmlet that could form the basic element of the alternative econ­omy outlined herein. It is known as The Landshare Project. In a landshare-based world, each family is a single indivisible socio-economic unit. Each unit is essentially self-sufficient in the basic needs of life. So purely from an economic point of view, its members would have little - if any - economic motive to interact with outsiders. Placing each family in their gleba of rightful landshares merely gives rise to a planet on which the human population is spread out evenly over its habitable land. A billion self-sufficient but disconnected families. It is easy to imagine such a world rapidly becoming a world of hermits. However, as well as our strong desire for self-sufficiency and solitude, there exists, deep within us, also an overwhelming need to mix and interact with others. Humans are not natural hermits. They are gregarious. Observation shows that, under any free social structure, almost every human being does interact with individuals out­side his own family unit, and that the interactions can be both frequent and intense. This suggests that psychological mechanisms must exist within the human mind from which must emanate the strong forces that drive these social interactions. These forces manifest themselves as a kind of synthesis of curiosity and thirst. One of these forces binds people together into what I term anthropological comm­unities. According to some anthropologists, each human being is capable of know­ing up to 150 other human beings personally and in detail. There are many living examples of this natural optimum for the size of human groupings. Some suggest that this limit is set by the physiology of the human brain. I therefore think that Landshare World would naturally crystallise into communities of from 50 to 150 people. Each person's coterie, however, never quite comprises exactly the same set of individuals as that of his neighbour. This gives human society more the con­stituency of a fluid rather than that of a structured lattice or a hierarchy. Another of these forces is the sexual force that drives a young adult to mix with his peers from other families to find a spouse with whom to start a new nuclear family for the next generation. But there are also emotional, intellectual, spiritual, social, cultural, educational, economic and recreational motives for interacting with people outside one's immediate family. The human life-form thus needs company as well as solitude. It needs to be part of a society that embraces both calm and chaos. The global society of mankind can therefore be seen as a billion family units which, under the influence of built-in sociological forces, interact with each other in a variety of ways according to a set of natural laws. Neighbour acts towards neigh­bour. Neighbour responds to neighbour. Neighbour interacts with one neighbour in one context and with another neighbour in a different context. Multitudinous cas­cades of action and reaction. A swirling hive of spontaneity, probability and chance. It is what mathematicians would rightly call a complex dynamical system. But a landshare-based society - as so far described - comprises a billion glebas in each of which a family lives and works. All these glebas must, of course, be conn­ected by some kind of transport that allows people to travel from their landshares to all parts of the world. But apart from visiting each other's glebas where would they go and why? As in today's world not everybody likes to live in the countryside, so too not every­body would want to live in a gleba. The relative isolation of a country life does not suit all of the people all of the time. But the social division of those who would like the quietness of landshare life and those who would like city life is complex. Different people have different strengths and abilities. This gives them different personalities and preferences. As a result, some people are, by nature, more greg­arious than others. They want to be near lots of people. They want to mix. They need to be much closer to a greater number of other people than would be possible in the relative isolation of a family gleba. Members of the same household can have very different temperaments and there­fore desire different social environments at different times. Even the same indivi­dual's social needs and preferences may change throughout the different stages of his life. Children, middle aged and old people would prefer - and benefit more - from life on the land. Teenagers and young adults generally prefer a city life where they can mix with others. And there are times when everybody - whatever their age or preference - needs the social stimulation of a large close group of people. There are also those whose preference is to travel. To live a wandering life, pro­viding the trading conduit through which artisanic produce can be distributed and exchanged. And there will always inevitably be those who are physically or mentally unable to work. These people, at these times, may prefer to be located away from their family glebas. So they are in no position to use the land to turn their labour into their needs of life. The landshare-based society must therefore be flexible enough to include means for supporting the more gregarious life-styles. And there are ways this can be achieved that should satisfy the diverse needs and preferences of all. So how should the city-dweller, the wanderer or the infirm deploy their shares of the planet's natural means for turning labour into the needs of life? What use would land be to them? The answer is that their share of the Earth's productive resources is their means of acquiring their needs of life - irrespective of whether or not it is their own bodily labour that is used to bring forth their needs of life from it. In the language of today we would say it is their personal capital. It can produce without labour. More specifically, an individual's portion of the planet may be made to yield the needs of life for them in response to the labour of another. A wandering merchant can hire an adjacent landshare-farmer to supply labour for the purpose of acquiring the needs of life from his landshare. In return, the merchant provides the farmer with useful goods from a distant land. The farmer's landshare yields to him the needs of life independently of the fickle ups and downs of a free market or the dictates of any controlling capitalist. But the livelihood of the merchant is open to the blind forces of the free market. He may prosper when the market is up, but his trade may disappear completely when it is down. Nevertheless, whenever his business should fail or recess, he always has the option to return to his landshare and deploy his own labour to acquire from it his needs of life. In the case of the young city-dweller, his portion of his family gleba is run by the other members of his family while he contributes something useful from whatever he does in the city. There is a good case for each landshare family also to have a city base. The portions of the child, the old and the infirm are run by the able-bodied. The old in their turn provide direction and advice. The infirm are profes­sional observers and thereby provide companionship and insight. The children pro­vide the future. This diversity in life-style ideally demands a very flexible type of accommodation. When we first got married, my wife and I had a little cottage. It was perfectly ad­equate for us at the time. When our first child came, suddenly there was no room to move. We needed a bigger house. We moved to a two-bedroom detached chalet. That was fine. When our two sons came along, even that was too small. We built an extension which turned it into a 3-bedroom house. Now our daughter is 28. She left home some years ago. She lives in London. In that bastion of capitalism, naturally as a single woman with an ordinary job, she simply cannot afford anything which could be described as acceptable accommodation. She has lived in uneasy house-shares and in two-room basement apartments with damp walls and nothing but a padlocked door to keep her possessions secure. I have often thought it a pity that she could not disconnect her bedroom from our house and couple it to a bathroom/kitchen service unit near where she works in London. We don't need her bedroom: she does. For this reason, I imagine a landshare-based home of the future to be a very flexible high technology device made up of a central unit to which are attached individual accommodation modules. An accommodation module would be capable of being disconnected from the central unit and moved when the grown-up child wanted to move to a village, city or the landshare of a spouse. Molecules, atoms and their elemental particles interact with each other through fundamental forces. These forces seem to permeate the whole universe. They form the fabric of space-time through which all things communicate. Society too needs an infrastructure through which all its members may communicate. Otherwise, soci­ety itself cannot function. In a nomadic society, encounters between groups would take place in much the same way as they do between molecules in the atmosphere. However, in most hu­man societies, most people live and work at fixed locations. This is true of our land­share based society. Although the human life-form is naturally mobile, its emotional dependence on its immediate family, and its economic dependence on the land which supports them, tie it predominantly to a particular geographic location. For them to be considered a society at all, it is essential for people from different family units to have access to a communications infrastructure through which they may interact. A gleba of landshares is a contiguous portion of the planetary surface whose econ­omic use is exclusive to the family that occupies it. So it is natural, sensible and functionally sound that each family's gleba of landshares be privately owned by them. those, which by their nature and function, best lend themselves to being implemented as single universal commonly owned systems. The opposing political ideologies of today seem to insist on promoting either one ex­treme or the other. One asserts that everything must be privately owned. The other asserts that everything must be publicly owned. They seem to ignore completely the engineering view that any device - be it mechanical, electrical or social - should be run in the way which best lends itself to the nature and function of the device. Again I acknowledge that the only perfect analogue of something is the thing itself. Nevertheless, I find it helpful to visualise these two classes of economic device as the two distinct classes of component which make up a modern telecommunica­tions network, namely, nodes and links. Modern society is essentially a small-world network. All networks have two kinds of component - nodes and links. Nodes are centric or point-like. Links are connective and distributive. The two types must be managed in different ways to suit their distinctive natures. Within any economy there are nodal elements such as homes, factories, shops and special services. These, by their very point-centred nature, can lend themselves to the privatised business method of control. But for an economy to function, these nodes must be selectably linked to each other by transport and other means of connection. This demands another class of elements called links. These are such things as roads, telecommun­ications networks, railways and mail. Because of their dispersive nature these latter can only work effectively as public services. Capitalist-oriented governments seem obsessed with applying commercial principles and the corporate model to absolutely every function in society. The idea is that by introducing competition into the provision of infrastruc­ture, great increases in efficiency and productivity will result. But for some things the point-centric corporate model is technically unworkable. Conse­quently, such extreme dogma can only wreak havoc within a socio-econ­omy. A ridiculously extreme example will make this clear. In an extreme capitalist society, all roads have been privatised. The road in which I live is provided and maintained by Acme Roads Ltd. This com­pany is in competition with another provider called XYZ Roads Ltd. If two competitors operate on one physical road, where is the competition? They must each operate their own. I decide that I am unhappy with Acme Roads Ltd who own and provide access service between my home and the main road. I therefore take my custom to their competitors XYZ Roads Ltd. My neighbour decides to stay with Acme Roads Ltd. So the only thing to do is for XYZ Roads Ltd to build another overhead road to my house. Acme Roads Ltd then block off their ground level access to my house while XYZ Road Ltd provide me with a ramp to their elevated road. Ridiculous in the extreme, but I believe the principle is established that there are some things which just cannot be done on the basis of true private commercial competition. 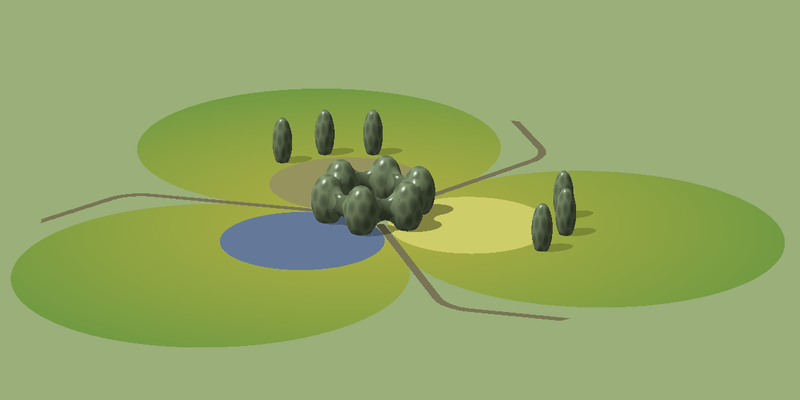 The nodes represent the privately owned socio-economic units - landshares. The links represent the commonly-owned infrastructure through which the landshares communicate. Notice that the links themselves join at nodes. This suggests that landshares have a role to play within the communication process, and that their owners have a public duty to carry out this role. The most important way in which the human life-form communicates is undoubt­edly through direct face-to-face conversation. This enables the communicator to use not only his voice, but also his facial expressions, his limbs, and demonstration aids. Thus he can use not only sound and sight, but also all the other human senses, as means of communication. Each sense adds a whole new dimension to the com­munication process. It thereby increases the depth and enhances the solidity of the message. Furthermore, direct face-to-face communication is two-way. Each party can both give information and receive it. It is interactive. Each party can react or respond immediately to the other. Whether it be a conversation between two friends, an individual addressing a group, or a company of actors performing to an audience, face-to-face communication is the fastest, most information-rich form of communi­cation possible between human beings. Nevertheless, although it be the most wide-band form of human communication, it can only take place over very short dist­ances. The fact that face-to-face communication can take place only when the parties con­cerned are within a few metres of each other is a very good thing. For a start, the human mind can only deal with one conversation at a time. The short range there­fore cuts out all potential distraction and interference from all the other convers­ations taking place between other people throughout the world at the time. How­ever, the greatest benefit provided by the short range of direct face-to-face com­muni­cation is the ease with which a person is able to control if, when and where he takes part. If someone wishes to engage in idle conversation at any particular time, he goes to a place where he knows others will be who also wish to pass the time in conver­sation. If two people wish to discuss something, they arrange to meet at a mutually convenient time and place where they can discuss their matter in private. If a person feels the need for a period of solitude and thought, he retreats to a private place where others will not disturb him. He thus controls his communication with others simply by going to, or keeping away from, particular places. So, coupled with the human being's natural mobility, the physically restricted range of human con­versation enables each individual unilaterally to determine and control his own per­sonal mix of socialisation and solitude. In order for human beings to be able to communicate, they must be able to travel. So if the planetary surface be essentially divided into privately owned glebas then a network of common ways of passage must be superimposed upon it. This is effect­ed by the definition of ownership in regard to a landshare. Ownership of a landshare bestows upon its owner the exclusive right to use it for his economic gain. It does not give him the right to forbid anybody access to pass across it, camp on it overnight, or simply walk over it to study, admire or enjoy its beauty. A visitor, on the other hand, is obliged to respect the land and the owner's privacy and not to interfere with the owner's economic endeavours. Human beings managed to travel the world perfectly well for thousands of years without paved roads. But this does not mean that paving is not beneficial. It makes travel smoother, and therefore, less fatiguing to the traveller and less wearing to his vehicle. It is also of benefit to the landshare owner in that it prevents through-traffic from churning up an ever wider swathe of ground in its attempt to follow an even route across his land. It therefore makes sense for a 'network of common ways of passage' to be paved and maintained in good condition. Indeed, the same can be said of footpaths to allow the visitor access to walk the landscape. The question is, who should be res­ponsible for maintaining the paved ways? Since the paving is used primarily by those who pass through, it seems reasonable that responsibility for the paving should be a collective one. The purpose of travel is to communicate. But speed isolates a traveller. The faster he goes, the more isolated he becomes from the environment through which he passes. The faster he goes, the less he is able to learn about it or benefit from hav­ing passed through. Speed also alienates the traveller. The faster he goes, the more alien his route becomes to those who live nearby. The faster he goes, the more he splits the community through which he passes. Speed isolates and alienates the traveller from the resident. It thereby wastes and destroys what could otherwise have been a valuable opportunity for them to communicate. Nature has had a long time and unlimited resources to come up with the optimum speed for creatures to transport themselves across the planet's surface. Apart from speeds in excess of 110 km/h reached in the heat of a chase, the normal maximum travelling speed for a land animal is about 60 km/h. The narrow highly-networked roads of Landshare World should therefore be home to ground-vehicles that encourage a cruising speed of around 60 km/h. They would be fuel-efficient. They would be spacious. They would be equipped with all that would be needed to allow a family to make long journeys independently of external en-route services. Their routes could be managed so that no link of the network could become over-burdened with traffic. Travellers would take all care not to harm the environment through which they pass or cause stress to those who live there. Throughout its history on this planet, the human life-form has often had the press­ing need to communicate with others of its kind over distances far beyond the reach of its voice. Separated tribal groups needed to tell each other of new dis­coveries of water, pasture and herds of animals to hunt. They had to send warnings of approaching bad weather, predators or hostile armies. They needed to co-ordin­ate searches for lost children or animals, broadcast news of notable events and disseminate wisdom. Though this communication was vital, the actual amount of information it needed to carry and the speed with which it had to be delivered, were both far less than normally took place in face-to-face conversation. The information itself was also more formally structured than it was in face-to-face conversation. Information in this form was known as a message. Because of its nature, a face-to-face conversation requires a wide-band short-range means of delivery. This is provided by the human voice and ears, and is enhanced by facial expression, bodily gesture and the other human senses. Because of its different nature, a message needs a means of delivery with only a narrow band­width, but with a far greater range. Being able to communicate over vast distances is one of the factors which has sec­ured the human life-form's dominance of the planet. It has been so important that I would speculate that the oldest profession is not what most people think it is, but is in fact that of the messenger. The simplest way to convey a message over a dist­ance is to dictate it to a messenger whose task it is to run to the person to whom the message is addressed and re-iterate the words that were spoken to him by the sender. An oral messenger can also make use of his facial expression and body gestures thus lending the full bandwidth of normal conversation to the conveying of the message. The only shortcoming over face-to-face conversation is the loss of dir­ect interaction between the message's sender and receiver. Messages sent by word of mouth aren't private. The messenger himself knows the message. The messenger may also forget, misunderstand or wrongly re-iterate all or part of what he was told. An oral message may not therefore arrive as it was sent. Both these problems are solved if the message is sent in written form under seal. Furthermore, its accuracy is maintained no matter how many hands it passes through en-route. This is the principle on which our present world wide mail service is based. Nevertheless, the written message loses the greater bandwidth provided by vocal inflexion, facial expression and bodily gesture. It can therefore never be quite as accurate at conveying the full and precise intent of the sender. This is why it has been the eternal quest of telecommunications engineers to push the limits of range, bandwidth and network coverage forever upwards. Relentlessly accelerating to­wards the goal of plugging every human being on this planet into unlimited wide band contact with every other human being on the planet. But is this a good thing? People need times of quietness as well as times of conversation. A telecommuni­cations infrastructure must therefore be engineered so that it does not interfere with this natural requirement. It must therefore provide barriers to communication as well as links. It is analogous to an electric circuit. In an electric circuit, insulators are just as im­portant as conductors. Likewise, a telecommunications infrastructure must allow in­dividuals the unpressured freedom to decide for themselves when to be available and when not to be available. It must let them decide just how available they are going to be at any time and to any particular person. In other words, each individual must be truly free to determine whether he is going to be available spontaneously through some wide-band interactive medium, or only through the relative privacy of posted mail. Nature is always the best guide. So it would seem sensible to model an artificial telecommunications infrastructure on the same two-tier system with both wide band short range and narrow band long range services. This constricts the flow of information that can bombard the individual from afar yet allows the rapid ex­change of information with neighbours. Given that the individual has mobility, he can thereby control when and with whom he engages in wide-band exchanges, while being accessible globally for short strategic exchanges of information and for hailing. He thereby determines his own personal mix of accessibility and isolation. This is in harmony with nature. There are times when one can't venture far. Weather restricts safe long-distance travel. It thus imposes upon us times to meet and times to retreat. Likewise, changes in the ionosphere dictate when and with whom we may communicate by the narrow-band long-range medium of HF radio. It thus imposes upon us times to talk and times to reflect. This is good. On the other hand, we can converse with close neighbours whatever the weather. Likewise, the wide band short range capability of UHF is unaffected by ionospheric phenomena. It therefore allows fast, close-proximity exchanges any time. And the need for close proximity frees the individual from the stress of being expected to be constantly and unconditionally open to the world. In a high-technology landshare-based society, therefore, every gleba would have a wide band short range link to adjacent glebas plus a long range narrow band facility for global access. The owner's vehicle would also be equipped with a wide band short range link. This would enable him to join a campus network temporarily to up­load local information from the places through which he travelled. It would also allow him to acquire specialised information by travelling to the proximity of its source, up-loading it and then returning home. A vehicular narrow band long range facility would allow him to exchange messages with his home base while he is 'on the road'. A landshare may have a long range narrow band facility which uses HF radio. However, its main long range narrow band access to the world should be through a global network formed by the wide-band links between all adjacent glebas. In this scheme, each landshare-owner would have a public duty to accommodate and maintain some form of wide-band switch to route other people's narrow-band traffic onwards to its destination. All kinds of traffic could be sent via this long range narrow band network - e.g. telephone conversations, telemetry plus audio/video and data files. Any telecommunications infrastructure should naturally be able to carry public broadcasting as well as point-to-point communications between individuals. Public broadcasting can perform a useful purpose. It must be borne in mind, however, that broadcasting should never be put in the position of being able to supplant social contact. For example, theatre viewed on television can never be properly appreci­ated by one who has not acquired the necessary interpretive context from having seen it live. Finally, it should be well noted that Landshare World is certainly not a return to a so-called idyllic past. It is a progression to an idyllic future. In this regard, the wide-band/long range communication made possible by modern technology does provide something new and beneficial. That is the possibility for individuals of like mind, in far removed parts of the world, to share their views and develop their thoughts together. This would create what is called a small-world society - an instance of the small-world phenomenon. But it must be used carefully. It must not be overdone. It must not pressure people to remain constantly plugged in to the future version of the Internet 24 hours a day. But used sensibly, it would be a valuable asset to human development. To my mind, far from making the world smaller and more claustrophobic, this would place the individual in a far bigger world - geographically, socially and intellectually. Economic empowerment is useless to anyone who does not know how to use it. Knowledge is a social resource - a collective inheritance enhanced and passed on by each generation. It is the one thing the individual landshare cannot supply com­pletely alone. It requires an additional collective means of provision. In Landshare World, you own absolutely the economic yield of your portion of the planet. There is no capitalist to stand between you and your land, siphoning off the fruits of your labour and leaving you barely enough to live on. All the fruits of your land wrought by your labour are yours. No individual or government can take your land from you for any reason. It is yours for the whole of your working life. The quality of life it affords you depends on how diligently and how virtuously you deploy it. Nevertheless, possession of land brings with it certain practical responsibilities and duties. Already mentioned is your duty to provide for the traveller. A place set aside for the traveller to camp overnight while en-route through your land. In a high-tech society, there is also a duty to provide paved roads across your land. Perhaps also the duty to provide relay facilities for a public communications network. These are things you provide directly yourself, and for which you are appreciated. Organise short (1 week) residential classes for much greater gather­ings at regional or national centres at conducive times of the year. Use multimedia telecommunications for on-going education at home on the family gleba. Use the gleba itself as a source of direct and practical education. Reducing attendance time does not mean that the quality of education received will diminish. Most knowledge imparted by today's education systems is unnecessary. Its purpose is simply to turn out the kind of human cogs that are currently in demand for capitalist economic machines. Most of it is obsolete within a few years and a new lot has to be learned - all to maintain the constant change that keeps the pro­fits rolling in. In a landshare-based society, an entirely new kind of education system is required. Its curriculum would embrace and reiterate all the timeless essentials of morality, social relationships, economics and the workings of nature. Education is a specialist task. It is a full-time task. It requires dedicated people who are absolved of the burden of having to expend their own time and effort to acquire their needs of life. For this purpose - and this purpose alone - landshare owners should be taxed. But what kind of tax would be fair? A tax on property would not be fair. A tax on consumption or need would not be fair. Neither would a tax on one's time and effort, namely a tax on labour. The only fair kind of tax is a small portion of the needs of life that the land you possess produces for you. Pay full heed to the fact that this tax is not on what you produce. It is on what your land gains for you. It is nothing to do with how much time and effort you put in. In today's world, the only people who would be liable to pay this kind of tax would be the capitalists. However, in Landshare World, everybody is a capitalist, in the limited sense that each owns a share of the means of transforming human labour into the needs of life. A large part - if not the vast majority - of modern sickness is no doubt precipitated by the intense stress and deprivation imposed on the human frame by capitalist exploitation. The stress of being driven by the clock. At the same level of productivity both summer and winter. At the filthy walls of an inner light well. Until the cold winter darkness has long since fallen. Exchanging diseases along the way. prematurely shatter my repose, long before the coming dawn. What better recipe could there be for stress, illness, depression, a miserable life and an early death? Finally it hits you. The sudden shiver. The dripping nose. The raw throat. The inces­sant cough. The coldness. The fatigue. The lethargy. The despair. Unrelenting dis­comfort. And in this sorry state, what does the capitalist world expect you to do? Stay in bed and rest as nature and common sense would suggest? No. It expects you to go to a telephone and make an appointment to see a doctor, then trudge over a mile in the freezing cold to the doctor's surgery to obtain a 'sick note' as evidence that you are indeed ill, then trudge over a mile home again. Otherwise it is assumed that you are a lying malingerer and you lose pay - or even your job. If you are unemployed you lose part of your welfare which is so low that the loss of any part of it means that you and your family cannot eat. But with your own landshare you are free to follow the seasons. You work hard in spring, summer and autumn when the days are long and bright. In the short days of winter, you can rest as nature does and spend time with your family and take time to read, think and plan. If you are ill you can take as much 'time off' as you see fit. You account to nobody but yourself in such matters since you possess and control the means that provide your needs of life. You will have already seen to the pro­visions of food and fuel for the winter. You do not need to go out in the winter cold. You are free to relax and to recover in your own time in order to regain your full fitness ready for when the warmth returns in the spring. But Landshare World still needs a universal healthcare system. Each anthropo­logical community needs professional help within easy reach of everybody. However, with Landshare World's universal communications network, expert systems can provide precise diagnostic and remedial advice within each home. This means that the vast majority of situations will not require professional intervention, thus alleviating the need for a vast top-heavy stress-laden highly-bureaucratic healthcare system.